Living With Cancer: What is radiation therapy? Radiation therapy is a type of cancer treatment that uses beams of intense energy to kill cancer cells. 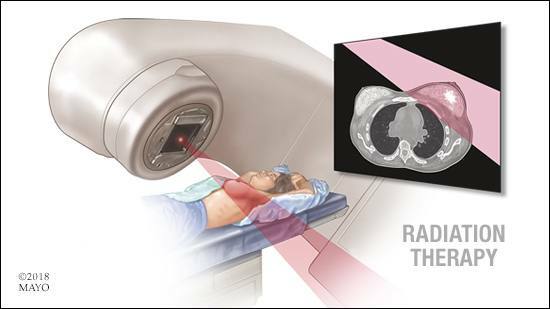 Radiation therapy is used to treat nearly every type of cancer, and more than half of all people with cancer receive radiation therapy as part of their cancer treatment. Here's what you need to know if your health care provider recommends radiation therapy. Opioid medications, commonly called narcotics, are used for managing pain, including cancer-related pain. Yet some studies indicate that up to one-third of cancer patients don't receive adequate pain treatment. People with poorly managed cancer pain are at increased risk of long and repeated hospital stays, disruptions in their treatment schedule, and difficulty managing the activities of daily living. Opioid treatment can play an important role in improving the lives of people with cancer. Learn more about whether an opioid medication might be the right choice for you, and the safeguards that are essential to prevent misuse, addiction and unintentional overdose. Alternative cancer treatments may not play a direct role in curing your cancer, but they may help you cope. Many signs and symptoms caused by cancer and cancer treatments, including anxiety, fatigue, nausea and vomiting, pain, difficulty sleeping, and stress, may be eased by alternative treatments. Find out if massage, yoga, music therapy, meditation and other alternative treatments might be right for you.